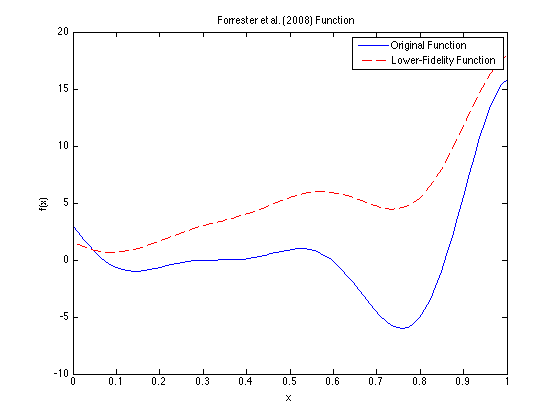 This function is a simple one-dimensional test function. It is multimodal, with one global minimum, one local minimum and a zero-gradient inflection point. The function is evaluated on x ∈ [0, 1]. Here, the constants A, B and C can be varied to improve the fidelity of the low-fidelity function. In the plot above, the values used are (as in Forrester et al., 2008): A = 0.5, B = 10, C = -5. Forrester, A., Sobester, A., & Keane, A. (2008). Engineering design via surrogate modelling: a practical guide. Wiley.